Part of the First Feature Competition, A Date For Mad Mary is an Irish production from writer Colin Thornton and first time film director Darren Thornton. Adapted from Yasmine Akron’s play 10 Dates For Mary and directed on stage by Darren Thornton himself, the film delivers hugely enjoyable comedy moments and is at times very touching. On paper, the script might not sound like the most original of ideas - but the story manages to win you over from the outset, with an entertaining dialogue and a realistic portrayal of a young woman stepping into adulthood, albeit reluctantly. Mostly funded by the Irish Film Board, the film is a refreshing spin on the romantic comedy strand, but also deals with themes of rebellion, identity, friendship and love. With a storyline which would feel at home within the more rigid structure of the Hollywood rom-com, Mary is however so much more than just a comedic love story. 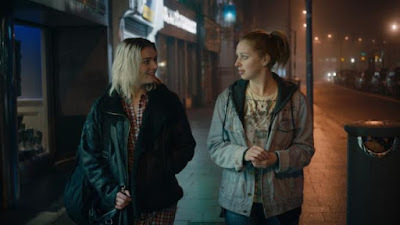 Mary, played with attitude and gusto by Seána Kerslake, is a young ex-con in search of a purpose after her release from a 5 year stint at the local jail. The film tells of her descent into self-destructive behaviour, and pining over lost friendships. As she attempts to pick her life up from where she left off, we see Mary failing to deal with feelings of alienation and distrust from her childhood best friend Charlene (Charleigh Bailey) who reluctantly asks her to be Maid of Honour at her imminent wedding. She is told she isn’t allowed a “plus one” for the wedding because she is single with no prospect for a relationship before the big event. Feeling left out, Mary embarks on a hilarious attempt at finding “a boyfriend” before the big day by joining a dating agency. Kerslake’s touching portrayal of a young woman struggling to get to grips with who she is makes A Date For Mad Mary into a charming and emotionally engaging comedy. The social realist aesthetics do not take away from the laugh out loud moments, nor do these moments take anything away from the pleasure of watching Mary finally learn who she is, when a chance meeting with the effortlessly cool photographer / musician Jess (Tara Lee) leads her into new adventures. A Date For Mad Mary is a brilliant study into emotional growth and fighting feelings of unmitigated anger with the world. The Thornton brothers manage to create a believable and highly sympathetic character in Mary; she is the anti-hero who we want to see succeed despite what she may have done in the past. All in all Mary is a beautiful portrayal of a woman coming to terms with her flaws and mistakes.